Nearly five thousand years ago, tea was mythically discovered when the wind blew tea leaves into boiling water. Ever since it’s become the most popular drink in the world. If you’re trying to cut back on caffeine or simply looking for a mid-afternoon boost, without the fear of staying up all night, one might think to steep a bag of green tea leaves for their ails. The best green tea is known to come from an early harvest. It’s likely that this is due to the nutrient balance that comes only from fresh tea leaves. 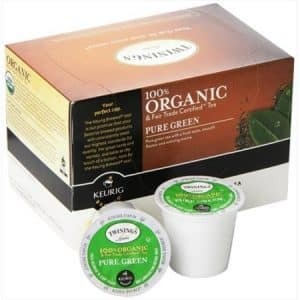 While it’s easy to store green tea around the house, in a cabinet that sits and gathers dust, making a sub-par cup of tea, a better option lies inside the sealed, quick-brew Keurig K-cups. So here are our picks for the best green tea one can get in those convenient little K-cups. Additionally, we’ve reviewed many of the best k-cups on the market. 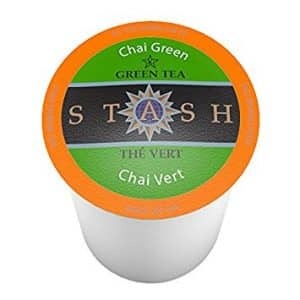 By blending green tea with cinnamon, whole cloves, cardamom, ginger root and sarsaparilla, Stash Tea is taking a traditional beverage and creating a unique green tea drink that’s ready in seconds with the aid of the Keurig brewer. The results from the K-cup are flavorful and spicy, this is a tea that goes well with milk and may be enjoyed any time of the day. This Stash Tea chai green tea blend can be both stimulating and calming. Stash Teas have instilled quality into their teas since 1972. 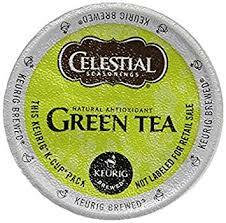 The company now uses that same dedication with the K-cup format, keeping green tea as fresh as ever because of that. Twinings of London is another longstanding tea companies. For their green tea, a trademark flavor and refreshing taste were made from leaves of the Camellia Sinensis plant, which also attributes some of the same tastes as black tea. While their green teas are processed to prevent oxidation and black teas are oxidized for additional color and flavor. The result is a delicious tea that brews to a light golden color and with a depth of flavor. Twinings organic green tea is based on a style called “Sencha”, usually a loose leaf tea known for its smooth, mild characteristics. Now you can have a fresh brewed “Sencha”, with natural lemon and leafy aromas. Who could mention classic tea flavors without consulting Lipton Teas? This isn’t the average black tea that you’d stick out in the sun for a few hours and though. 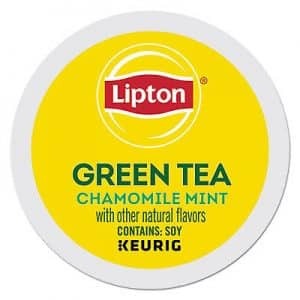 Lipton has an interesting pairing for their K-cup tea, a green tea blended with chamomile and mint. Fresh, rainforest certified, tea leaves impress upon the drink a touch of calmness, unsweetened and soothing. This new take, with a classic brand, offers a taste that’s not too complex for the early morning but rather, is sure to make the sunrise an enjoyable one. Lipton green tea with chamomile and mint is the blend you’ve been searching for. Cha4TEA has created a balanced green tea that doesn’t go bitter or stale. These are fresh and one-hundred percent natural leaves that are sourced sustainably. Jasmine is the forward flavor profile in this beverage, with green tea adding a balance to what can be typically an overwhelming spice. High floral and rich in antioxidants, this blend of green tea and Jasmine blossoms are subtly refreshing and yet refined and palette quenching. 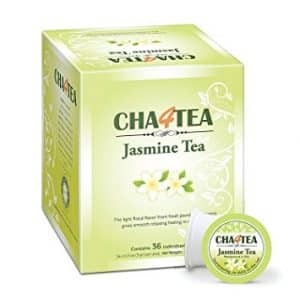 If you’re searching for green tea as a wakeup call but needs a bit of extra spice and flavor, then Cha4TEA Jasmine Green Tea is a great solution to your quandary. Matcha, a powdered green tea substance, was historically used in Japanese tea rituals. Matcha also is thought to have some incredible health benefits. For instance, the nootropic L-Theanine is present for an alert calm. There’s also plenty of antioxidants and disease-fighting Catechins. Bringing this typically difficult to find or expensive drink to the K-cup is a home run. Teas’ Tea green tea with matcha comes from one of Japan’s finest tea plantations. It’s made by gently steaming the tea leaves, then rolling & drying them to stop oxidation. This age-old process ensures freshness, aroma, and bright, vibrant color of the green tea leaves, aiding to a high quality and simple green tea. 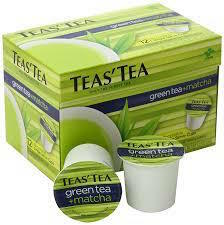 Teas’ Tea green tea with matcha is a quality green tea that will leave you satisfied and feeling great. Truly derived from the green tea leaves specifically for the health conscious. 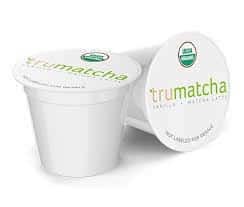 These TruMatcha green tea pods feature just matcha with no added colors, sweeteners, or flavors. Grown completely organically in Nishio and Uji, Japan. Known to be a natural energy booster, among its many other health benefits (immune system set to one hundred percent), this K-cup is a great way to start the day if you need something to give you the extra mile. Avoid the mess that typically accumulates in a matcha prep session and enjoy the ease of the Keurig K-cups. Celestial Seasonings creates quality tea, and their tea creating process speaks volumes. As green tea leaves are dried after the harvest it’s done hastily and with care to preserve their vibrant color and naturally occurring flavonoid antioxidants. Celestial Seasonings green tea blend is combined with an infusion of Bai Mu Dan white tea for a refreshing taste, with fresh flavor and a smooth finish. 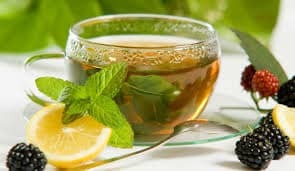 The tea also has added antioxidant Vitamin C to support your everyday wellness. Feel refreshed and know that you’re getting an immune-boosting vitamin too. 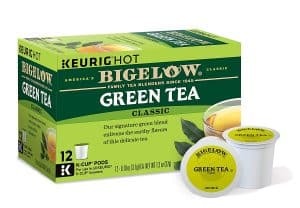 Tried and true, the smooth flavor and very delicate green tea, made by age-old company Bigelow Teas, provides that boost of caffeine without being overwhelming. Orthodox Union Kosher and rest assured to work with Keurig brewers. Since 1945 and three generations, the Bigelow family has specialized in creating a world-class tea. Their Green tea is no different. Bigelow Classic green tea is gently processed to produce a green tea that’s never grassy or features astringent of-tastes. We hope that one of these K-cups will fit the bill. Waking you up in the morning or providing a relaxing beverage in the afternoon or evening. The wonderful thing about brewing with the Keurig is that if the beverage is too strong or has cooled down, then adding hot water is possible in a flash. Additionally, if you feel like working some other tea making gear into your daily routine, you can peruse our selection of fine wares here.